Knowing this information can help predict what types of scoliosis symptoms may be experienced and howthe condition can best be treated. Thoracic, lumbar, and thoracolumbar scoliosis all refer to location, while terms such as dextroscoliosis and levoscoliosis indicate whether the spine curves to the right or left. 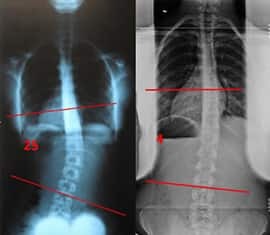 Thoracic scoliosis describes curvature positioned in the middle, or thoracic, part of the spine. It is the most common location for scoliosis curves, and often includes deformity of the rib cage and spine. As the rib cage develops asymmetrically, one shoulder may become lifted or one leg may appear longer than the other. Lumbar scoliosis occurs in the lower, or lumbar, part of the spine. It may cause one hip to appear higher than the other or one leg to appear longer than the other. In some cases, lumbar scoliosis is degenerative, developing after age 50 due to a breakdown of the spine — as opposed to the more common adolescent idiopathic form, which presents no known cause. Those with degenerative lumbar scoliosis may exhibit no symptoms at all, or they may become severely disabled. With thoracolumbar scoliosis, the curve includes vertebrae from both the lower thoracic and upper lumbar parts of the spine. It is often congenital, occurring in utero during the third to sixth week, and detectable at birth. It may even be the secondary effect of a neuromuscular condition (such as spina bifida or cerebral palsy). Thoracolumbar scoliosis usually involves a curve toward the right and occurs more often in females than in males. The side view of the human spine has natural curves to help absorb the stresses of everyday movement. When viewed from the side, a healthy spine has gentle curves; when viewed from behind, it runs straight down the middle of the body. With scoliosis, the spine develops an abnormal sideways curvature that can range in severity from mild to severe. Other conditions may cause the spine to curve inward or backward. The spine is comprised of 33 individual bones (including the pelvis), called vertebrae, which are stacked one on top of the other. The spinal column is part of the skeletal system which provides structure and support for the body while also enabling movement. Only the top 24 vertebrae are movable, and they are divided into three regions: cervical, thoracic, and lumbar. The sacrum is the set of five bones that, together with the iliac bones, make up the pelvis, while the coccyx region consists of four fused bones that make up the tailbone. Both the sacrum and coccyx are fused in place. When viewed from the side, a healthy spine should have a natural “S” shape consisting of three natural curves. The cervical spine (the neck) and the lumbar spine (the lower back) both exhibit a slightly concave curve while the thoracic spine (the middle back) has a gentle convex curvature. The curves of the spine work almost like a coiled spring, compressing to absorb shock while still allowing a full range of motion throughout the spinal column.